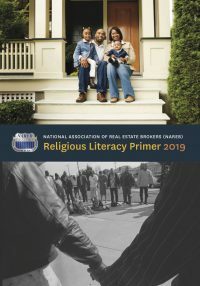 The USC Cecil Murray Center for Community Engagement created this religious literacy primer for the National Association of Real Estate Brokers (NAREB), in an effort to help members of the organization engage with the faith community to promote homeownership and wealth-building in African American communities. According to the National Association of Real Estate Brokers (NAREB) Members Guide Book for Success (2017), “NAREB introduced the 2 Million New Black Homeowners in 5 years (2Mn5) program not only to jumpstart wealth-building through homeownership, but also to heighten awareness among Black Americans, policymakers and the general public” of the importance of economic strength in African-American communities and the necessity of building that strength to benefit the nation’s economy as a whole. To date, NAREB has worked to educate, train and build the capacity of realtists to assist them in overcoming unique hurdles to homeownership in Black communities. The aim of this programming has been to achieve democracy in housing. This report will focus on engaging the faith community as an additional element of the strategy in pursuit of 2Mn5 program goals. The aim of this report is to provide real estate agents with information about religious organizations located in predominantly Black communities. Houses of worship are cornerstones in Black communities. Faith communities and institutions have been sources of political movements such as the Civil Rights Movement and the Underground Railroad, and they are also one of the strongest economic engines in the community. Many houses of worship own rental properties, apartment buildings and commercial real estate, while also being the spiritual home for people from all socio-economic backgrounds. This document will assist real estate agents in their efforts to market to Black communities through connections to local faith-related organizations and leaders.